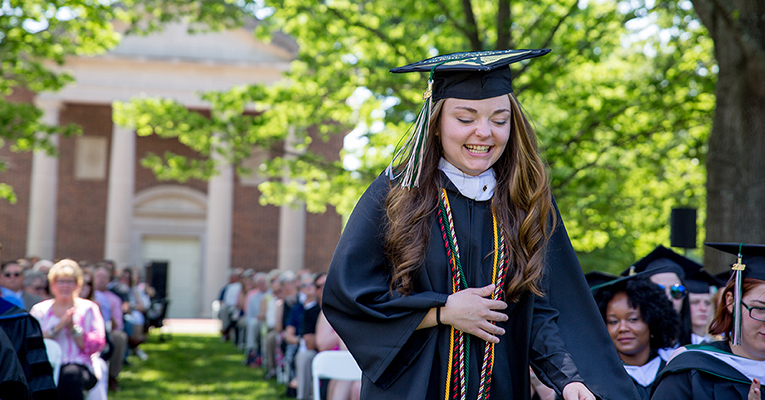 Each year, Sweet Briar College gives special recognition to several graduating students through its all-College awards. The following recipients were honored during commencement on Saturday, May 12. The Penelope Lane Czarra Award was established by Edgar F. Czarra Jr., father of Penelope Lane Czarra of the Class of 1975. The award honors the senior or seniors who best combine scholastic achievement, student leadership and effective contributions to the improvement of the quality of student life at Sweet Briar. The recipient for the Class of 2018 is Emma Grace Thom. The family of Professor Judith Molinar Elkins established a prize in her name to recognize the outstanding achievements of a senior majoring in the mathematical, physical, environmental or biological sciences who has actively participated in the College community and demonstrated the ideals and dedication to learning exemplified by the life of Professor Elkins. The Judith Molinar Elkins Prize went to Makayla Barbara Benjamin. In honor of Dr. Connie M. Guion, Mr. and Mr. J. Wilson Newman and their daughters, Clair Newman Blanchard ’60 and Mildred Newman Thayer ’61, established an award given to a member or members of the graduating class for excellence as a human being and as a member of the College. The recipients of the Connie M. Guion Award for the Class of 2018 is Emily Barrett Dodson. The Walker Family Award honors a senior or seniors with high scholastic standing, a cheerful, positive disposition, and who show warmth, generosity and humility. This year’s recipient is Elizabeth Anne Phaup. Each year, the College recognizes academic achievement by conferring upon the highest-ranking member of each class the honorary title of Emilie Watts McVea Scholar. In addition, the National Council of Alpha Lambda Delta sends to each chapter a book to be awarded to the graduating Alpha Lambda Delta member who has the highest GPA. The recipient of both awards for the Class of 2018 is Lydia May Gullicksen.